Who is ready for all things apple? 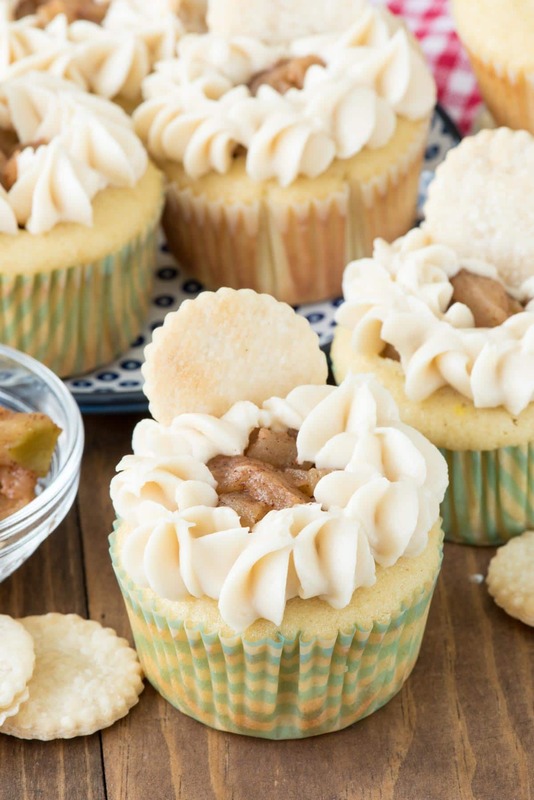 I am counting down the days until we can go apple picking…and until then I’m making Apple Pie Cupcakes to hold me over! I think jury duty is kind of a crock. I mean, I get it, really I do. If I ever get arrested, I hope to have a panel of twelve of my peers to decide I’m innocent, but as a registered voter it’s really kind of annoying, especially since I got called over the summer. My first notice had me reporting to duty smack dab in the middle of summer. Setting aside the fact that I own my own business and am the only employee, so if I don’t work I don’t get paid, Jordan is now 11 and I can’t use “stay at home mom” as an exemption. Really, that’s total you-know-what because I work full time from home so that I can also be a full time mom. I pushed the date off until this week, because at least then school would be in session. As the date neared, I started to really stress out. Mel had to plan a trip, so I’d have no child care. I have my race in two weeks (OMG) so what happens if it’s a long trial and the judge is a jerk? I also have two more trips in September for work. For some reason, there is no “I’m getting anxiety thinking about how to work and be in LA and be a full time mom and be at court” exemption. Luckily the nice jury duty clerk let me put it off again, until October. I guess I better get all my fall baking done NOW, just in case. Besides pumpkin, apple recipes are my favorite come this time of year. Apple pie is my favorite dessert, after all, so I love turning it into other recipes. I’ve done french toast, pancakes, magic bars, and now cupcakes! 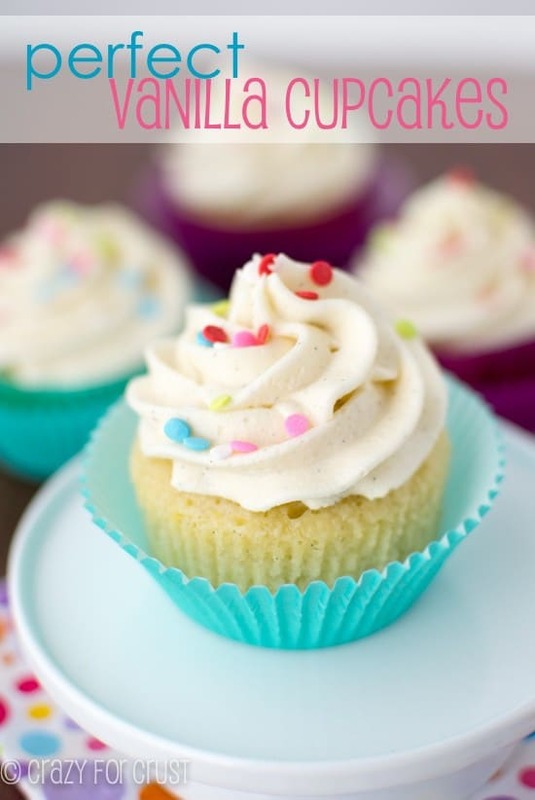 The beauty of these cupcakes is you can start with my recipe or a boxed cupcake, or even get some plain cupcakes from the bakery section at the grocery store. You can substitute a canned icing (although my homemade recipe is SUPER easy and way better tasting). You can even make the pie crust chips from a refrigerated pie crust (or use my homemade all butter pie crust recipe). You can start with any kind of apple you like. I normally have Granny Smith or Gala/Fuji on hand, so that’s what I use. 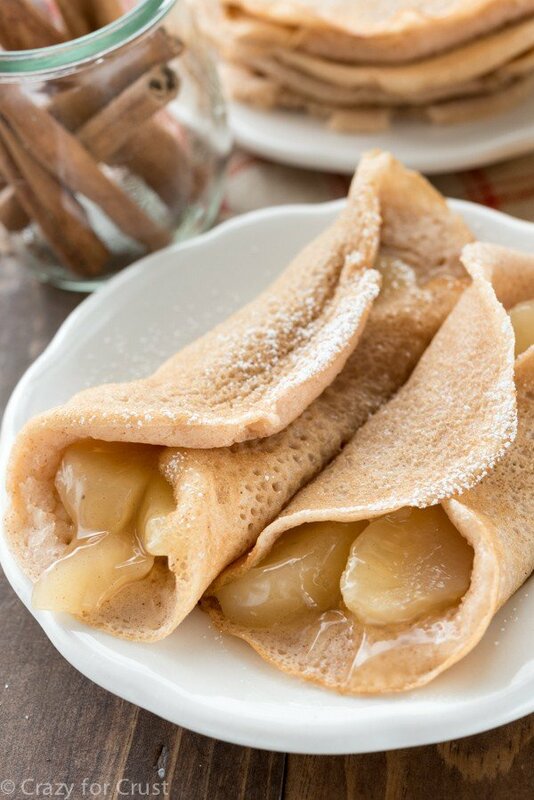 I peel, core, and dice them and then cook them with butter, sugar, and cinnamon until they’re soft. You’re not cooking the apples once they’re in the cupcake, so just get the apples to the point of doneness you like in your apple pie. I like a more smooshy texture, whereas you might like apples in pie more crisp. Cook them to your desired consistency! Definitely add these you your fall bucket list though. And then un-register yourself to vote so you don’t get called for jury duty. I’ve thought about doing that but then…I like voting. Gah, I like the whole “making cupcakes for a living” thing so much better than adulting. 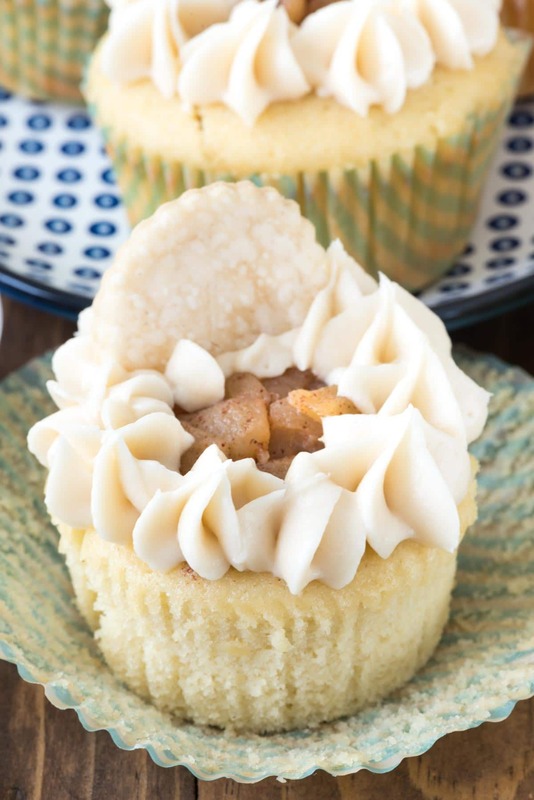 Apple Pie Cupcakes combine apple pie and a vanilla cupcake recipe! 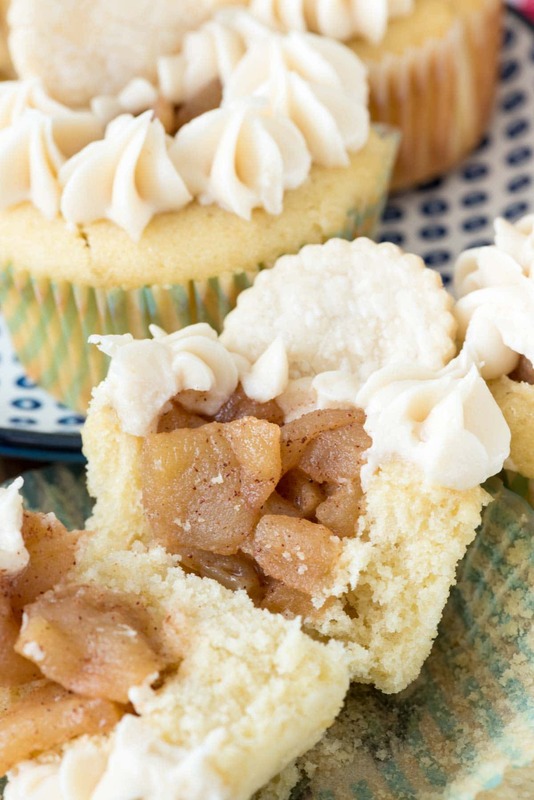 Fill easy cupcakes with homemade apple pie filling, frosting, and a pie crust chip. Melt the butter in a skillet over medium-low heat. Add the apple and stir to coat. Sprinkle with the sugar and cinnamon, stir. Add water, then cover and cook on low heat until the apples are soft, stirring often, about 5-10 minutes. Let the apples cool. Make the pie crust dippers: preheat oven to 400°F. Cut 2” circles from the pie crust and place them on a parchment paper lined cookie sheet. Sprinkle each with a pinch of granulated sugar. Bake for about 5-10 minutes, or until they are golden brown. Cool. Make the frosting: Beat butter until smooth with a hand mixer. Slowly mix in the powdered sugar and pinch of salt until crumbly. Add vanilla and 1 tablespoon heavy whipping cream. Beat until smooth, adding more cream as needed for consistency. Cut out the center of each cupcake. Add a tablespoon or so of apple filling to each cupcake. Pipe vanilla frosting around the edge of the cupcake so that you can still see the apple filling (I used a 1M tip), then top with a pie crust chip. Store loosely covered in the refrigerator for up to 2 days. I just had my jury duty stint. Try not to stress out. The odds are that you will not get picked, and even if you do, the cases aren’t usually that long. Fingers crossed for you, Dorothy! I’m glad you’ve been baking ahead, though. These are totally marvelous. Maybe you can bribe the judge? Good luck with jury duty. Remind me to tell you when I see you some stories. These cupcakes are adorable! They put me in the mood for fall! In Colorado, jury duty picked by driver’s license registration so can’t just not vote! They usually call off court here so I’ve only done one half day. Thanks for the recipe, going to try it with gluten free cupcakes! These look crazy good! I love apple pie filling (especially homemade because it’s not quite so sweet)… and cupcakes so this is a win-win! Ahhh, jury duty. It’s not just from voter reg. Also, drivers license and I think property owners. I’ve only rec’d about 4 notices in my life and I’ve never had to serve so don’t sweat it. If you do have to serve we could come up and get Jordan to/from school for a few days. And you could bring goodies to the other jurors all the time; they would love you!!! Great looking cupcakes; wish I was there to try them. OMG 4 MONTHS? That is INSANE. I’m ready for all things fall! Bring on the apple and pumpkin goodness! And boy, I sure hope you get an easy jury duty after all that stress!